UFC 79 is right around the corner, so its time for my UFC 79 picks to be published. As of now, we have odds available for 3 fights, so I’ll go over those 3 in this post. Chuck Liddell has been off his game for his past two fights and bettors have been taking note. According to an interview I did with Bodog this past week, the bets are coming in at a 5-1 rate in favor of Wanderlei Silva. That is a huge rate for a fight that has pretty even odds. As you know I love to go against the public opinion, and this situation is stacking up perfectly. 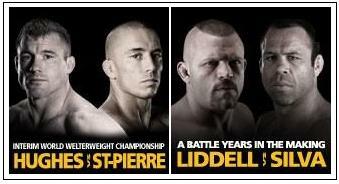 This looks like a great spot for Liddell, so Im gonna put $210 on Chuck. Georges St. Pierre is a decent favorite in this fight, and he should be. The oddsmakers for this fight are giving Matt Hughes approximately a 30-35% chance to win this fight. I think Hughes should at least have a 40% chance to win this bout, so I do see some value in betting Matt Hughes. I’m gonna make a small play on Hughes in this fight. I really have no opinion either way on this bout, and I’m not gonna place a bet. I think the line is just right so there is really no value to gain by betting on this fight. If I had a gun to my head, I’d take Rameau at +100. Ughh what an ugly fight this is. I’m not really sure why this is even a main card fight. Sao Paleleihasn’t been in the ring for what seems like a century and Eddie Sanchez hasn’t really shown us anything to prove he’s a good enough fighter to bet on. There’s too many unknowns with this fight to make a smart bet on it, so I’ll pass. Luis Cane is a bit of a mystery to me. He has a great MMA record of 7-0 but I’ve yet to see much of him. James Irvin is coming back from a knee injury that put him out of the loop for a while. Before the injury Irvin had some solid wins and I think this will be a big comeback fight for him. He’s probably been itching to get back in the octagon, so this bout will mean a lot to him. I have no opinion on the last three fights and won’t be putting any money on them.